What is a Jewish Partisan? Who Were the Jewish Partisans? They were Jews in Europe, many of them teenagers, male and female, who fought against the Nazis during World War II. The majority were regular folks who escaped the ghettos and work camps and joined organized resistance groups in the forests and urban underground. Non-Jewish partisans could sneak back to their homes for security and safety. The Jews had no place to go and so they were constantly moving through the shadows on the edges of cities and towns. Some, like Polish teenager Frank Blaichman, knew their village would be turned into a ghetto; Frank escaped and joined a group of partisans in a forest. Others, like Abe Asner, were among the very few Jewish partisans with military training. Most partisans knew nothing about guns and ammunition, so people like Abe became important teachers and leaders. People who had guns and knew how to use them were mostly welcomed with open arms. If someone wanted to join and had no weapon, some groups required them to get one, in whatever manner they could. 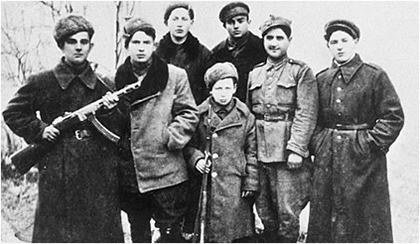 Outsiders who came to fight the Nazis – like Russian partisan groups in Poland – valued Jews who knew local terrain and could act as their scouts. Less than ten percent of the partisans were women. Some were fighters and scouts; the majority were part of the vital infrastructure, cooking for the group and caring for the sick. Those with young children often stayed in hidden enclaves in the forests. Some partisan groups, like the Bielski Brigade, accepted these families, but most groups did not. Jews who joined non-Jewish partisan groups often hid their Judaism because of antisemitism. Norman Salsitz, for example, used seven non-Jewish identities while fighting the Nazis and was able to save dozens of Jews from certain death. What is a Partisan? 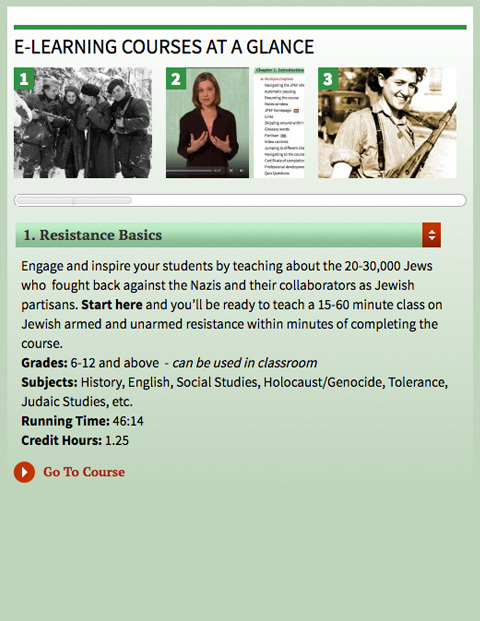 What Defines Resistance? During World War II, the majority of European Jews had no idea that the Nazis were conducting a meticulous disinformation campaign to convince them that they were going to work camps instead of being exterminated. Yet between 20,000- 30,000 Jews escaped from Nazi ghettos and camps to form or join organized resistance groups. These Jews joined hundreds of thousands of non-Jewish partisans who fought the Germans, but they had to worry about local antisemites. Often they formed all-Jewish groups to protect themselves from their old neighbors. Jewish resistance took on different forms. Physical resistance by the partisans was something that hurt the Germans. Spiritual resistance may not have affected the Germans and their collaborators directly, but it was important to the Jews, since the Nazis wanted to take away their dignity and self-respect. In defiance of the laws, the Jews held prayer services, or taught children to read Hebrew; those who performed in theater groups or in concerts, who painted pictures and wrote poems, were part of the resistance, though they had no guns. There were smugglers who sent children to safety and couriers who carried messages between the ghettos, as well as forgers who created documents for use in the outside world. Jews in the work camps sabotaged guns and other products they were making for the Germans. 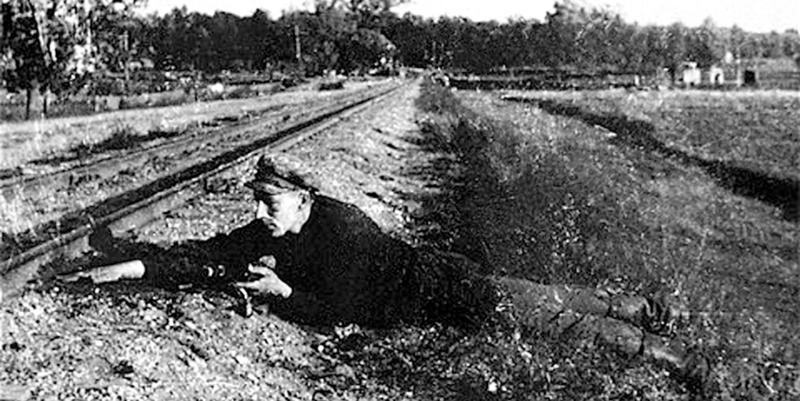 Partisans with ammunition blew up thousands of Nazi supply trains, making it harder for the Germans to fight the war. In Lithuania, Jewish partisans were responsible for significant damage to Nazi trains. Partisans also destroyed numerous Nazi power plants and factories, and focused their attention on other military and strategic targets, rather than on civilians. When Did the Partisans Fight? 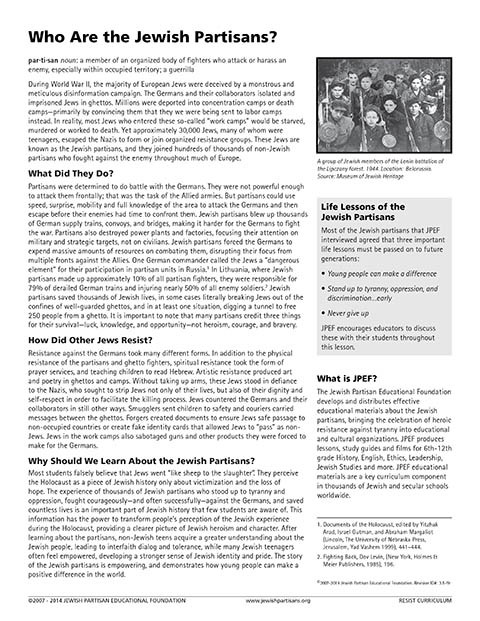 Most of the Jewish partisans took up arms in Eastern Europe after the Hitler-Stalin Pact failed, and war between the Germans and the Soviets began in June 1941. When the Germans marched on Moscow, they captured hundreds of thousands of Soviet soldiers. Many escaped into the forests and swamps of Poland and Ukraine, where they continued the war. The first known Jewish resistance was in Belgium, in 1939, when the group 'Jewish Solidarity' was formed. When the Germans occupied the country in 1940, the Jews joined the Belgium Army of Partisans and were especially active in the underground press, distributing leaflets calling for rebellion and resistance. The Jews in France joined the resistance in 1940, after the Nazis took over most of the country, leaving the south of France in control of the collaborationist Vichy regime. The Vichy regime could not control the population as effectively as the Nazis, so it was easier for partisan groups to form in the south and spread out. The Jewish round-ups and deportations from France began in 1942, so the Jews had some warning and some fought back. In the spring of 1941, after the Germans invaded Greece, which had two large Jewish populations – in Solonika and Athens – Jews joined the two main resistance groups, the National Liberation Front and the National Popular Liberation Army. In Italy, many Jews joined underground resistance groups like the Garibaldi and Freedom and Justice Fighters. After June 1941, the Nazis rounded up the Jews in Eastern Poland – an area formerly under Soviet control. They either shot the Jews at the mass graves they forced them to dig first, or deported them to camps and ghettos. 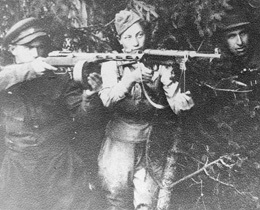 Some of the Jews realized what was happening and, determined to fight back, ran into the woods to join the partisans. Where Did the Partisans Fight? Jewish partisans fought in almost every country in Europe. There was partisan activity in Belgium, Poland, Russia (Belarus and Ukraine), France, Italy, Greece and Lithuania. The partisans hid their encampments in the forests, swamps and mountains. In urban areas it was much harder for them to operate. For example, only 80,000 Jews lived in Greece, while the Jewish population in Poland numbered around three million. The Jews in Greece, including Leon Idas, fought with the People's Liberation Army and National Liberation Front. In Poland, they joined units of the Polish Army and the Army Ludova. In France, Jews like Bernard Musmand joined the Maquis underground fighters. Walter Marx fought in Italy in groups like Liberty and Justice. Holland, too, had its Fighting Squads..
Russian partisan units in Eastern Europe were highly organized and trained people to use guns, to dynamite bridges, and operate in a military fashion. Military order was kept in these groups and you could be shot for falling asleep on guard duty. Moscow, an ally after 1941, supported the partisans in Eastern Europe and air dropped food, radios, weapons, and munitions for them. The British supported Greek and Italian partisans. How Did the Partisans Accomplish Their Goals? 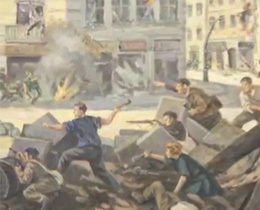 The partisans fought and survived by forming organized groups. 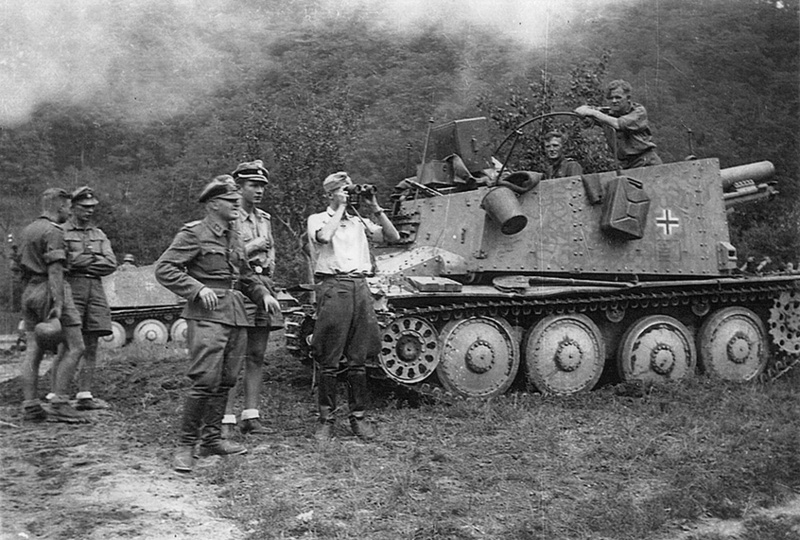 Compared to the Nazis, they had few arms and little ammunition, but were successful because they knew the lay of the land and how to use the terrain to their own advantage. One partisan remembered that, "In the forest, ten partisans seemed like a hundred to those on the outside." The Nazis didn't know what it was like inside the forests and swamps. The partisans lived there under harsh conditions – without real shelter to protect them from sub-freezing temperatures and storms in the winter, or from heat and rain during other seasons. Medical supplies were scarce, and partisans died from infection and disease spread by lice. Bandages were washed and reused whenever possible. Most successful partisan activities took place at night, under camouflage of the dark and with the help of the local population. Without the locals who gave them food and information, the non-Jewish partisans would never have made it through the war. Jewish groups had an even tougher time: because vicious antisemitism prevailed even among the locals in some areas, the Jews had to sometimes use force to get supplies and information from them. The partisans begged, borrowed, bribed and stole whatever they needed and did whatever they had to do in order to survive and fight against the Nazis. As the war progressed, the Allies began to airdrop supplies to the partisans. Many Jewish groups had to fight for the valuable medicine and weapons that came to them via parachute. Radios and communications equipment, along with radio operators and Allied officers, were also sent to the partisans to train and better help with partisan infrastructure.